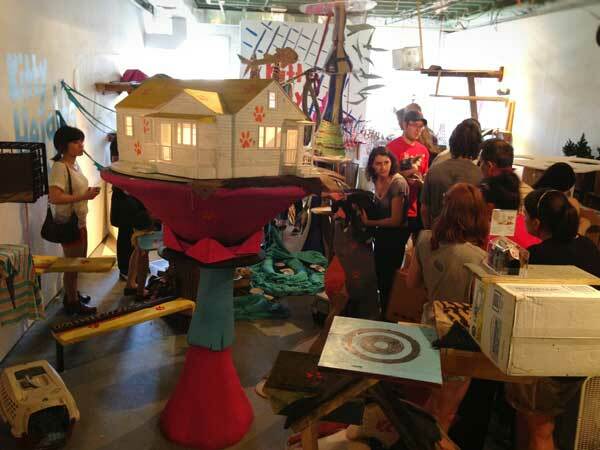 Artists built the small city for an adoption event. The structures were cool — and the cats adorable. I’m a proud member of the cat-obsessed club, so people often write me about cute and quirky feline-related happenings. Last week’s batch included an email about an event called Kitty City. The blurb billed it as a miniature urban city for cats that was being crafted out of recycled material that would be housed at the Flux Factory gallery in Queens, New York. Wonderfully, the completed meowtropolis would then be flooded with kittens for an adoption drive. So, irresistible stuff! Kitty City, the perfect urban meowtropolis for cats. Beyond the draw of getting to spend a Saturday afternoon watching a bunch of playful furballs scamping around their own village, I also hoped that Kitty City might inspire a few ideas on how to fancy up the next cardboard box that arrives at my apartment. My own cat, Mimosa, is afflicted with that curious addiction to cardboard that the feline form seems to consider a virtue. So after hiking over to Kitty City for the event last Saturday, here’s the inside scoop on what happens when a coterie of cats get to take control of their own town. I was not disappointed at the cardboard action. A sign outside the entrance to the Flux Factory set out the Kitty City Manifesto, a statement of intent and guide to good living within the mini-municipality. It included the declaration, “We, citizens of Kitty City, have come together to begin a radical empathy experiment: to build a humane and just city for cats.” The manifesto also detailed twelve common cat moods in a handy infographic form. Everything in Kitty City was made out of reused materials found in New York City. Cardboard was predictably prominent. According to the Flux Factory’s executive director, Christina Vassallo, before being open to the public the Kitty City buildings and its many ramps were thoroughly tested by Mr. Wilson, an older white and orange cat who lives with one of the builders. Mr. Wilson gave the endeavor a couple of enthusiastic paws up, and, buoyed by his sagely endorsement, the kittens took to merrily sliding around for the afternoon. If you were a kitty, wouldn’t you love your own pot of wheatgrass to come home to? One of the most popular attractions for the kittens was a large white house perched on a colorful pedestal. Inside the house was a container of wheatgrass — which might explain why one little grey-and-white guy decided to camp out on the stoop and make the property his own. Crowds of snap-happy fans flocked. Kitty City’s various boxes and buildings were embellished with toys for the cats to play with. One rambunctious kitten was particularly taken by the combination of some USPS boxes attached to a wall and a green ribbon to swat at. A nearby coil of wire also provided another kitten with a solid hour of playtime. With a steady stream of potential adopters and inquisitive cat enthusiasts lining up to enter Kitty City throughout the day, some of the cats were understandably a little over-awed. Thoughtfully, Kitty City was peppered with snug hiding places where a shy kitten could curl up and secure a little sanctuary from the crowd. You can craft an extravagant cat-centric city, but sometimes there’s nothing more alluring than getting inside of a cardboard box. Smartly, Kitty City featured many corrugated coves for the cats to conquer. A video montage was projected outside the entrance to Kitty City. Titled Creature Comforts, the project by Jennifer Hsu and James Wang aimed to question “what are the comforts and discomforts of creatures who live in spaces that we have constructed?” This mainly translated to endearingly absurd images of cats lounging around New York City subway platforms. Despite being given the once-in-a-lifetime opportunity to frolic around a fantasy feline world, many of the kittens were content to find a place to perch and snooze off for the afternoon. So predictable! Adopted kittens were transported home in kitty carriers made from thick repurposed fabric wrapped around wooden boxes crafted by the Flux Factory team. Every adoption was accompanied by a kitten’s new owners reciting the official Kitty City Pledge to “uphold the ideals and principles” of the venture. The staples of a clean litter box, healthy food, and shelter were included. The Kitty City pledge was only complete once the new owner had winked both eyes at the oath giver and their adorable new kitten. 11. The cannibalization of Kitty City! In remembrance of the cat metropolis in Queens, you can head over to the official Flickr account to see a behind-the-scenes slideshow of the rise and fall of the great Kitty City. Pull Up a Chair at the Banquet for America By BRENDAN CARROLL Read the original here.Read the original here.